Sensory information about things like motion, equilibrium, and where your body is at in space is provided by something called a vestibular system. Your vestibular system is the part of your ear that includes the utricle, saccule, and three semicircular canals. The utricle and saccule detect gravity and front-to-back or side-to-side movement. In contrast, the semicircular canals detect rotational movement. With your eyes, your visual system figures out where your head and body are in space and also your spatial location relative to other objects. Our balancing pose for Yoga with Melissa 367 is Hasta Padangusthasana or Standing Hand to Big Toe Pose. This yoga pose highlights the imbalance that exists between the front and back of your body. The backside of your body is often referred to as your posterior chain and includes your low back, your glutes, hamstrings and calves. These muscles are long and weak from our endless hours of sitting. Additionally our quadriceps and psoas muscles become tight and short from sitting in chairs for many hours of the day. Furthermore hasta padangustasana asks us to focus on balance, bringing our body’s center of gravity into alignment with the earth underneath us. Balancing poses liking standing hand to big toe pose ask us to come into physical equilibrium with the ground underneath us. However, as we know from our previous classes on balance, this doesn’t happen by remaining still, rather from rebalancing ourselves through our proprioceptive, vestibular and visual systems from moment to moment. Coming into balance again and again through balancing postures takes sustained effort. When we are practicing balancing postures, or the lead up poses to balancing postures we are continually centering and re-centering ourselves. The information that travels through our proprioceptive, vestibular and visual systems acts as a kind of tuning fork not only for our balance system but also for our nervous system. When we practice balance we will feel more centered and calm. 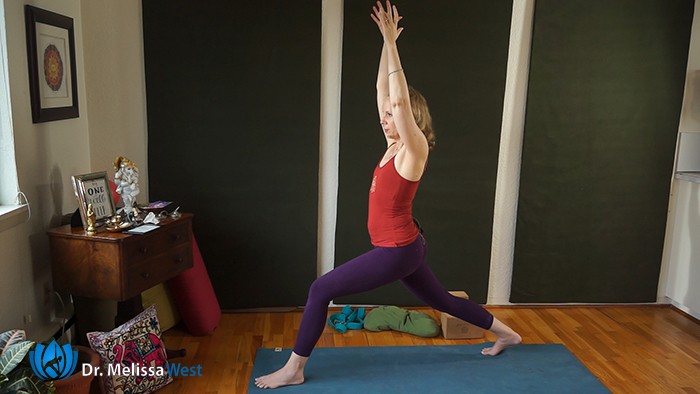 Hasta Padangusthasana is a balancing yoga pose that promotes stability as well. In order to stand on one leg you need to have strength and stability through the muscles and joints of your supporting leg. This pose will strengthen the arches of your feet, your ankles, and thighs well lengthening your calves and hamstrings. We put out a new class like this every Friday so if you are new to our channel, then please subscribe so our class will show up in your feed on Fridays. Today we did some brain yoga for balance. If you want access to some of the leading edge research on balance then join our membership community to access our brain yoga classes. Next post: Vlog 51: What should we do for our birthday?